When she was nine months old, Mellissa Hershberger visited her future job site for the first time. 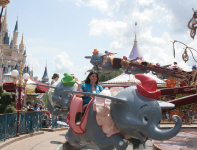 She was the oldest in a big Indiana family that made a yearly pilgrimage to Walt Disney World. As she grew, she knew she wanted someday to be a part of designing the magic of that place. And after graduating from Purdue's civil engineering program in 2005, Hershberger headed to Lake Buena Vista, Florida, to do just that. Working for the Walt Disney World Architecture and Facilities Engineering department, Hershberger is one of four structural engineers whose careful calculations underpin creative vision with nuts-and-bolts science. Her job is largely one of preventing things from "succumbing to gravity," she quips. From catwalks in the interior of the massive new Everest attraction in the Animal Kingdom Park to reinforcing Dumbo's ears and tail with rebar in the Magic Kingdom, Hershberger has had a hand in supporting the dreams—and weight—of visitors and cast members alike throughout Disney World. Hershberger notes that the realism that defines the theme parks presents a special challenge to her as an engineer. "At Purdue, I mostly worked with standard materials like steel and concrete," she says. But at Disney, she finds herself designing with unusual materials, like African hardwoods and thatched roofing. "Thatched roofing!" Hershberger laughs. "Who knows about that material? I had to get books, call people, and just figure it out. Then, because the material is so combustible, I had to consult fire- safety codes, too. The learning curve is exponential." Another reason Hershberger likes her job—besides the ability to visit the parks anytime she wants—is the variety of her projects. "One day I might be working in the Living Seas exhibit, dealing with live creatures and water, and the next day I could be designing speaker brackets for the roof of the Contemporary Hotel to pipe in music from the 'Wishes' fireworks show," Hershberger says. "Many structural engineers spend years working on one bridge. My projects might last a few hours to a few weeks, and I can go right out and lean on it and wiggle it, see it in action." Some of Hershberger's assignments originate from the field, where maintenance crews identify issues for her to address. They might need better access to some lighting within an attraction, for example, so she will design a catwalk that permits them to sneak in and do their jobs. With 47 square miles of park grounds to cover, that part of the job is huge. Hershberger enjoys the collaborative dynamic that comes with working for an engineering firm in the entertainment business. "It's fun to have so many people and perspectives in play," says Hershberger, who also admits that it is sometimes hard to fit everyone in one room for meetings. The Everest project is a good example of how Disney pools brainpower to craft the fantasy for which people travel with their families from far and near. The Disney "Imagineers" create the concept and design the ride. Then come artists, landscapers, food and beverage people, merchandisers, maintenance crews, ride and show personnel, and Hershberger's own architecture and facilities engineers, who are essentially in charge of the "guts" of the attraction. "Of course I do lot of 'calcs,'" says Hershberger, "but I'm not stuck in a cubicle." She likes to take her lunch in the parks sometimes, where she sees the happy faces of the kids who remind her of her young self. "I often go into the park on my lunch time and see the faces of the kids enjoying things I've worked on.